In the last two decades, considerable attention was devoted to the use of ionic liquids (ILs) in organic syntheses. Initially, they were applied as solvents, often playing the role of the catalyst as well. Nowadays, there is a growing trend to apply the ILs as cosolvents, additives, or catalysts in organic reactions. The spread of ILs justified several reviews on reactions carried out in the presence of different ILs. However, there is no sharp line between the cases, when the IL is used as a solvent, or only as a catalyst. This review aims at summarizing the examples of organic syntheses promoted by a catalytic amount of an IL, and highlighting the typical IL-catalyzed reactions. Keywords: Ionic liquid, additive, catalyst, syntheses, green chemistry, co-solvents. Keywords:Ionic liquid, additive, catalyst, syntheses, green chemistry, co-solvents. Abstract:In the last two decades, considerable attention was devoted to the use of ionic liquids (ILs) in organic syntheses. Initially, they were applied as solvents, often playing the role of the catalyst as well. Nowadays, there is a growing trend to apply the ILs as cosolvents, additives, or catalysts in organic reactions. The spread of ILs justified several reviews on reactions carried out in the presence of different ILs. However, there is no sharp line between the cases, when the IL is used as a solvent, or only as a catalyst. 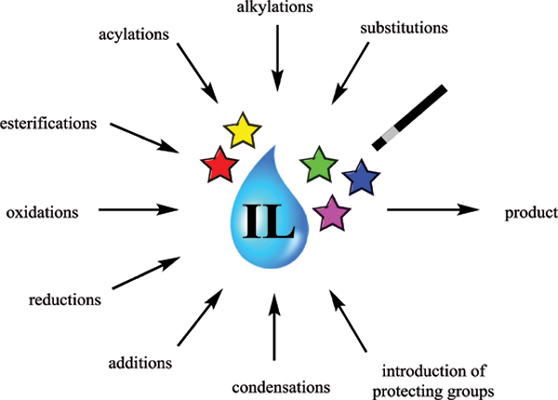 This review aims at summarizing the examples of organic syntheses promoted by a catalytic amount of an IL, and highlighting the typical IL-catalyzed reactions.